Thanks to a newly developed computational method, Luxembourg researchers can accurately predict how one subpopulation of cells can be converted into another. "The method has great potential for regenerative medicine when it comes to replacing cell subpopulations that have been lost in the course of disease, for example," explains Prof. Dr Antonio del Sol, head of the Computational Biology group of the Luxembourg Centre for Systems Biomedicine (LCSB) at the University of Luxembourg. In collaboration with Parkinson disease's researchers of Karolinska Institutet, Sweden, the scientists tested the practical feasibility of their method: they showed that, based on the computational predictions, stem cells from the brain could indeed be reprogrammed and ultimately converted into the desired subtype of neurons. The researchers presented their results in the journal Nature Communications. 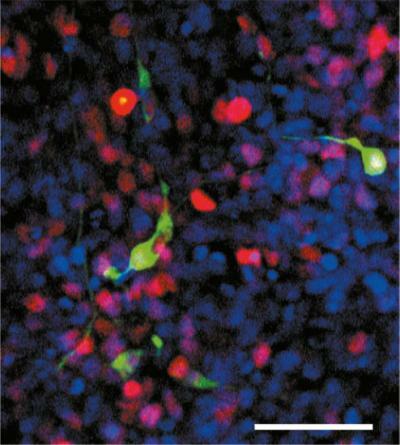 Skin cells and neurons are not the same, that much is clear just from looking at them. But even cells of the same type can have fine differences in genetic activity that sometimes have a powerful influence on their cellular function, giving rise to different cell subpopulations or subtypes. For example, dopaminergic neurons are nerve cells in the brain that produce the neurotransmitter dopamine. In the course of Parkinson's disease, these cells in the substantia nigra of the midbrain die off – but not all of them. Only one specific subtype of these cells dies off. "The identity of a particular cell subtype is characterised and maintained by a few interacting regulatory genes", del Sol explains. "Yet the differences between the subtypes are subtle and difficult to detect using the existing analytical methods." In order to address this problem, del Sol and his team developed the computational platform "TransSyn". Its predictions are based on the gene expression programs of individual cells in a population. Following a multistep computational pipeline, TransSyn searches for subtle differences between cell subtypes. The researchers know there are always multiple, synergistically interacting regulatory genes working together to characterise a subtype. Once these synergistic 'transcriptional cores' have been identified for each subtype, there are enough data to move onto laboratory applications, such as converting one cell subtype into another. To do that, the scientists treat cell cultures with specific factors to alter their gene expression profiles. These factors activate certain genes while deactivating others. The Luxembourg researchers are continuing to test the applicability of their platform at present, for example in collaboration with the Gladstone Institute in the USA. The American researchers, led by Deepak Srivastava, are looking for an efficient way to convert heart cells of the right ventricle into those of the left ventricle and vice versa – because the two subtypes exhibit subtle differences in their gene expression profiles and thus functional activity. "We have the predictions already. Our colleagues in the US will be starting their experiments in the next few weeks," del Sol said.